Jeanie Riddle plays. In this new work she has built platforms that function both as visual elements, and like the surface of a canvas, as sites of action and rest. They are where the stuff Riddle is playing with finds a moment of stillness. A cross between painting, sculpture, and retail display, Riddle’s arrangements feel like 3D snapshots of a process, caught just before everything begins to move again. The possiblities are endless and the use of materials is intuitive and fun, not to mention beautiful. JEANIE RIDDLE lives and works in Montreal where she recently earned an MFA from Concordia University. In May 2005, she recieved a full fellowship to The Vermont Studio Centre. Riddle is the recipient of the inaugural Yves Gaucher Award and her work in painting has been shown in Montreal, at Rad’s, Pratt and Whitney, and Studio Orange, and in San Francisco at Somar and Natoma Space with recent collaborative work presented at Centre des arts actuel SKOL and Alley Jaunt in Toronto. 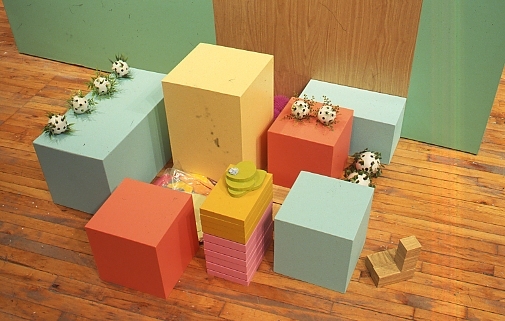 A solo installation work was recently on view at The New Gallery +15 project space in Calgary (Outside Bliss CPD) and at Optica, Montreal(Floating Floors…or maybe just a pile of love), March 2006.